This unique book describes and organizes nearly 2,500 mystery titles. Divided into sections-amateur, public, and private detective-titles are then categorized as traditional classic, eccentric, lone wolf, and so on. Niebuhr even notes whether each detective is of the hardboiled, softboiled (cozy), or traditional type. Author, title, subject, character, and location indexes offer further access. With more than 2,500 titles and more than 200 authors, this book provides an excellent understanding of the genre. An indispensable resource for librarians and mystery fans. 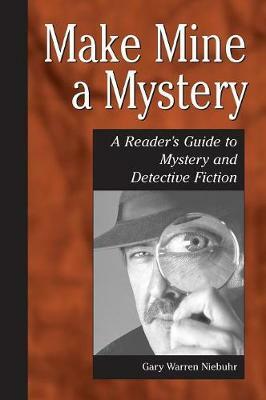 If you've been searching for a comprehensive readers' advisory guide for mystery and detective fiction, look no further. With more than 2,500 titles and more than 200 authors, this book will provide you with an excellent overview and a thorough understanding of the genre, from topics of interest, a history of mystery fiction, and subgenres, to hints for advising readers, and a discussion of collection development and preservation techniques. Even with no prior knowledge about the genre, with this guide you will find it easy to answer questions raised by readers. And if you're an avid reader of mystery and detective fiction, you will love this book as you explore titles and gain an even deeper insight into the genre. Books can be searched by author, title, character, subject, and location. An indispensable resource for library professionals, educators, and mystery fans!